Like you, I’ve been captivated by the wild landscapes of the San Juans and southwest Colorado for many years. That’s why I quickly gravitated to San Juan Citizens Alliance in the 1990s when I found it to be the go-to group working to safeguard those wild places. One of my favorite, out-the-way spots is the East Fork valley at the headwaters of the San Juan River, east of Pagosa Springs. This empty, 10-mile long valley is wonderfully devoid of modern development, just a dirt road and a single 2800-acre ranch. In the 1980s, conservationists successfully stymied a massive ski resort proposed for the valley that would have rivaled Vail in size. But in the late 1990s, another iteration of development came around, this one a private luxury club with several dozen trophy homes, hundreds of timeshare condos, a golf course and private ski slope. The fancifully named “Piano Creek Ranch” was a gut punch to locals who cherished this wild valley. Fortunately, SJCA was ready and able to tackle this new threat. The Alliance did what it does best, mobilizing local citizens to effectively rally and influence decision-makers. We hosted an informational open house in Pagosa Springs, where 150 concerned folks packed into the fairgrounds. We created a local steering committee that met monthly to plan strategy and events, usually hosted by rancher Betty Feazel at her scenic At Last Ranch at the confluence of the East Fork and the West Fork at the foot of Wolf Creek Pass. Volunteers found outlets for their skills and passions, creating an “East Fork Day” festival at the town park, painting “Save East Fork” billboards, and hosting hikes and campouts. We marshaled our technical skills as well, and made it clear to the project developers that obtaining permits from the Forest Service, and state and federal agencies, would be a long, slow, expensive process for them. Our David and Goliath fight drew the attention of the New York Times. Betty and I graced the paper’s front page with the tale of our fight. The developers had purportedly lined up a half-dozen billionaire club members, from the likes of America’s rich and famous families, including the Bechtels (construction fame), Kohlers (plumbing fame), Mars’ (candy fame), Penskes (racing fame), and more. The Times’ reporter, while sympathetic, told Betty and me we had no chance to beat back all these billionaires. What do you know? It turns out billionaires looking for quiet vacation retreats don’t want to be the centerpiece of a contentious, vigorously opposed real estate development. 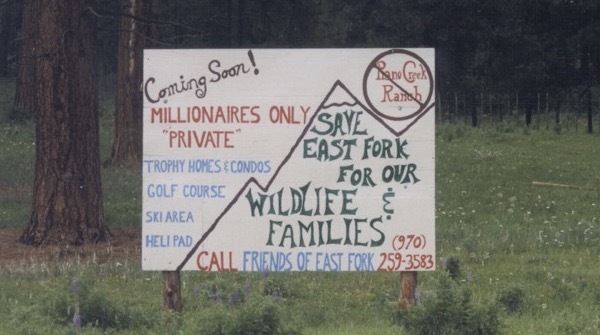 As we won skirmish after skirmish, mobilizing widespread local opinion against the project, forcing the developers to head down the path of expensive and complicated environmental impact studies about wetlands and riparian corridors and elusive lynx and snowplowing a dozen miles of avalanche paths, the billionaires started dropping out. In a year or two, the project collapsed. Eventually, a decade later the ranch owner (a Chicago real estate developer) finally saw the wisdom of just leaving the valley as is, and his family placed a conservation easement on the property. So head on up the East Fork valley next summer – turn at the East Fork intersection on Highway 160 past the CDOT maintenance yard and the highway bridge – and enjoy a picnic or fly fishing or a hike to Silver Falls, with a nod of thanks to SJCA and an army of concerned citizens unwilling to idly sit by while their cherished retreat was despoiled. 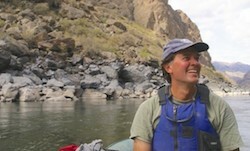 Mark is a long-time advocate for Colorado’s wilderness, rivers and public lands. He first got involved with San Juan Citizens Alliance in 1993 as a volunteer working on forest management and wilderness, leading the effort to craft SJCA’s Citizens Plan for the Wild San Juans that was finalized in 1999. Mark’s volunteer involvement with the Alliance led to a decade-long stint as Executive Director until departing in 2009. Mark currently works as a consultant on wilderness conservation and is completing a history of Colorado’s wilderness designation campaigns. His passion for local, home-grown conservation advocacy led him back to SJCA in 2016 as a Board Member to help tackle new and ongoing challenges.